The Cohiba cigars Behike are the best cigars in Cuba. They are - instead of 3 - rolled even with 4 insert sheets. The fourth tobacco leaf is a so-called. Medio Tiempo tobacco, ie So one of the top two tobacco leaves, which is formed only by a few plants. Thereby the Behikes receive significantly more strength and flavor variety. In order to smoke fine cigars in a matching ashtray, there is the Cohiba Behike ashtray , which is held on the basis of the mark in black. The Limited Ascher has three shelves and a huge ash dump. In the middle of the ash dump the Cohiba Behike logo is displayed in gold color. The shelves are held in gold color. The ashtray has a footprint of 23.5 x 23.5 cm and is cm 9 cm high. A very nice piece, which is unfortunately limited. 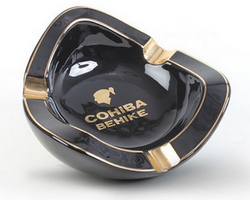 For Behike friends or as a gift this very noble ashtray is the first choice! Quick access.